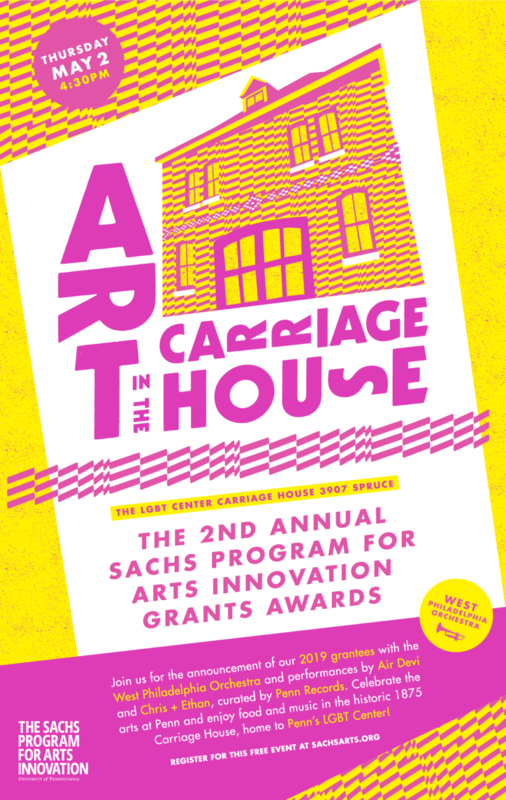 Please join The Sachs Program for Arts Innovation in celebrating their 2019 Grants Awards. Learn about this year’s grantees and join the arts community for food, drink and music at Penn’s LGBT Center. Loosen up to the brassy Balkan sounds of The West Philadelphia Orchestra and performances by Air Devi and Chris + Ethan, curated by Penn Records. Bespoke swag from Undergraduate Fine Arts and Common Press. Remarks by Provost Wendell Pritchett, Vice Provost Anita Allen, and Sachs Program staff and Advisory Board members will begin at 5:30. The Sachs Program for Arts Innovation was established by Penn Alumni Keith and Kathy Sachs to support the arts at Penn. Special thanks to the LGBT Center, Undergraduate Fine Arts, Common Press, and Penn Records. Poster design by Jason Killinger.